How do I do hair and make up for a dance performance ? Professional Celebrity Make Up Artist and Hair Stylist Amy Prifti holds individual make-up and hair workshops at your dance school Within Sussex, Surrey and Kent. 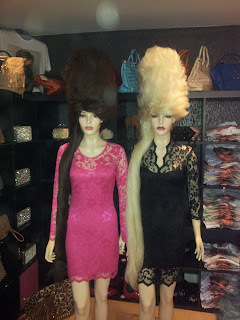 Meet Barbara and Wendy - Harry's mannequins with their new hair...... extra high with extra length! Harry asked for two more wigs the same style but in different colours to be made up so that he can change the hair colours from time to time. Modelled by Harry and Myself ! Who says that work can't be fun? Getting Married in 2013 ? OK, so you have probably worked out by now that my business is in Weddings...... So I turn on the news on the 1st of January 2013 for a report to be shared that NO ONE is getting married in 2013 because of its superstitious date! According to the news report many venues and businesses are offering special 'deals' to entice those getting married so that they don't postpone their wedding to 2014. Are people REALLY this superstitious that the number 13 will bring bad luck to their marriage? If I, for one was thinking about getting married over the next few years, I would probably bring the date forward and choose to get married in 2013 just to prove people wrong! - That a number will not affect how happy my marriage is, or the longevity of it.